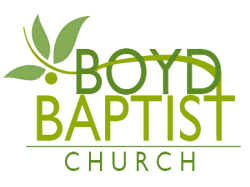 Boyd Baptist Church began at May 1st, 1949. Boyd Baptist Church, from the outset, had a heart for missions. It began as a mission from First Baptist Church in Bonham, TX back in 1942 and held Bible Schools for the community. Their first outreach resulted in 19 conversions! Since that time Boyd has grown and flourished in Fannin County and is still going on missions to Latvia, Ecuador, Mexico, and Zimbabwe. Our goal is ever-present in our minds to " go and make disciples of all the nations."